Video presentation now posted on the Employee Intranet. Watch your email for the link to the video file. 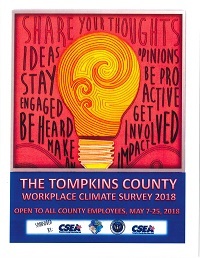 This spring just over 70% of our workforce participated in the 2018 Workplace Climate Survey. As we shared during the launch phase of the survey, we are committed to sharing the information garnered with all of our employees as we work together to learn from our current climate and create opportunities for a better climate in the future. Our survey vendor, the Kaleidoscope Group, will be in here present the preliminary findings, on August 2nd. This meeting will occur in the Legislative Chambers from 1:30-3:00pm. All staff members are welcome to attend this initial roll out session, with supervisor approval. During this presentation, we will learn about the processes used by Kaleidoscope as well as see a short summary of the County-wide results. During this session staff members will be able to ask questions directly from Kaleidoscope and learn more about the processes used to develop and implement the survey. This session will be recorded and made available to any employee that is unable to attend. Please note, this is only the initial session as further roll out sessions will be provided by our internal staff beginning this fall. The internal roll out sessions are still being developed at this time, but we look forward to working with all of our employees to make Tompkins County an even better place to work. If you have any further questions about the August 2, 2018 meeting they can be directed either to myself of Amie Hendrix (x5312). Get involved. Be proactive. Stay engaged.